Create a truly classic look with the Fitz and Floyd Yuletide Collection. This vintage-inspired set features antique design, seasonal golds, reds and winter motifs that will bring the true spirit of the holiday to your home. Timeless charm, rustic textures and elegant gold accents make the Yuletide Collection the refined gift choice. The Fitz and Floyd Yuletide Santa Figurine is a truly special way to set the scene of any holiday display. 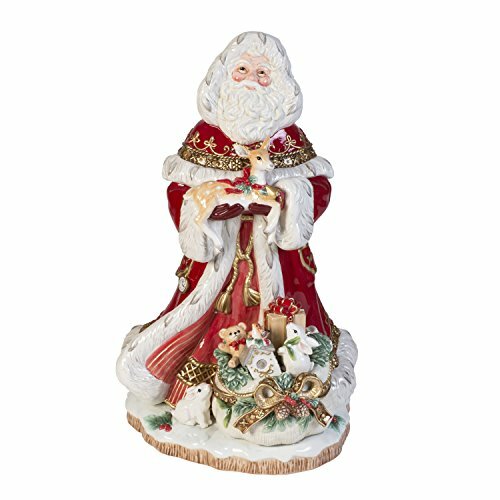 This charming figurine features vintage-inspired colors, ornate embellishments and a welcoming Santa bearing gifts. A perfect gift or centerpiece to set the holiday scene. Figurine measures 12.5" x 12.25" x 19" and is crafted from earthenware, wipe with a cloth to clean.